Had a car accident? Please don’t worry! However, we need your cooperation to make this as easy as possible. Please read the following documents carefully as they contain important information. At time of rental, which protection did you use? You must call your personal car insurance company or broker to report the accident immediately. Their number is found on the pink slip or your insurance agreement. 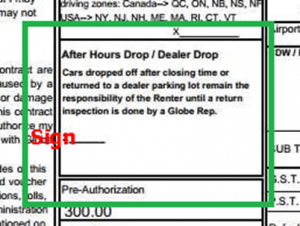 You will be asked a series of questions and you will be given a claim #, relay this claim number immediately to: claims@globecar.ca (be sure to include your contract #). If you prefer not to open a claim, you must pay the entire claim directly to Globe immediately. We will advise you when the claim is closed. Failing to comply in initiating the claims process within 48 hours will result in violation of your rental agreement. Remember: you are ultimately responsible for the loss until it is settled and payment is received from your personal coverage. Will my insurance premium go up if I make a claim? It depends. Different insurance company guarantee no rate increases even with multiple claims if certain conditions are met. It is best to check with your broker. This is why we recommend and informed you to purchase Globe’s coverage to avoid such risk. What if I don’t want to open a claim, can you make me a deal? No. We need to recuperate the cost to repair or replace the loss according to the manufacturer’s standard. We use approved repair shops that are certified to meet the manufacturer’s requirement and who use Audatex Estimatics Software to determine the repair time by model and damage. All prices are industry set and defined by repair catalogue for each item Parts and Labour. Can I repair the vehicle myself or send it to another garage? No, for liability reasons Globe is ultimately responsible for the integrity of the vehicle which will be rented to future drivers. Therefore, legally we must ensure that the vehicle is repaired according to Manufacturer’s standard with pre-approved body shops we have inspected and authorized. Can I know the repair amount first in order to make an informed decision? What is a Joint Accident Report? Please click here to read about the Joint Accident Report and obtain a copy. Do I have to fill out an incident report? Yes, fill out an incident report at all times and it must be given at return. 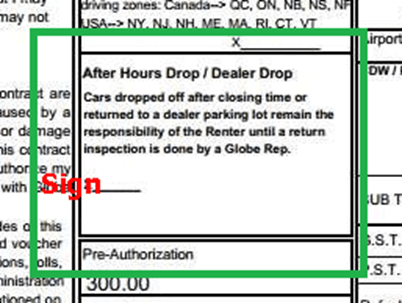 If you have not completed one, please do so and send it to claims@globecar.ca and write your contract number. Do I have to fill out a police report? Major accidents when police are involved or the vehicle was undriveable. One of the above applies to me, when do I have to report my accident to the police? Immediately! We require that you report any accident/loss to us immediately via by phone. If for some reason we are not reachable especially after closing time, please send an email describing the incident and your contract #. If the police will not visit the accident site due to lack of injury or damage, you must then supply a “Joint Accident Report” found in your rental car’s glove box. I didn’t do the damage myself and found it like that after I left it in the parking, do I still have to pay for this? Yes, often damage occurs while you are away. You remain responsible for the vehicle until it is returned to us and verified by a physical agent. I dropped off the car after hours and there was no damage? According to the rental agreement, all renters are responsible for the vehicle even after they return it and until it is checked in by a physical agent. To avoid this, you can return the vehicle during normal business hours. This damage was already there, so I am not responsible, right? If the damage was already there, then it would be noted on the car rental damage diagram at the time of pick up. If not, you need to open a claim because this is new damage. I used the kiosk and I sent pictures of new damage I found before I left, now what? I have a deductible, who pays that? The policy holder. Your own insurance policy determines the amount. You will have to pay the deductible directly to us. If you are not at fault, your insurance company will cover the full cost of repair. What will happen if, for any reason, my insurance doesn’t want to pay for the damage? You are ultimately responsible for the loss and must reimburse Globe immediately for the damage or loss. Can’t Globe call my insurance and open the claim and do the whole process on their own? No, your personal insurance policy belongs to you and you are the sole beneficiary. We cannot open claims on behalf of clients, insurance companies won’t accept it. Can I continue to rent even if I have a claim? Yes, provided you are not in breach of contract with previous rental and that you have opened a claim with your insurance company. What if I don’t open my claim? Your file will be sent to collection, incur fees, interest and other charges. This will affect your credit rating as well. It is just a hubcap, can I buy it myself? No, all replacement parts must be approved, replaced by Globe or its affiliated repair shops.